Are the facts right? I’m almost done with my family history and have been determined throughout to make sure that I’m writing a story that accurately aligns with history and other sources of data. One of the last items that I needed to confirm was whether my uncle’s name really appeared on the various World War II monuments in San Antonio, TX that my grandmother had talked about in her own writings. My uncle, Ernest O. Kelley, had survived the Bataan Death March and endured a POW camp, but never made it home. He was declared “presumed dead” in 1946. As I’ve lived on both the west and east coasts in the United States, San Antonio, Texas, has always been a little out of the way. However, it turns out that kind people in Texas were willing to help me. I emailed the President/CEO of the Witte Museum and she checked the Memorial Wall for my uncle’s name. Within 24hr I had the picture shown above. Similarly, my grandmother had written that my uncle’s name also appeared on the World War II plaque at Brackenridge High School. Would a high school staff member ever have the time to check for me? Like the Witte Museum, the school office patched me through to the head of the Jr. ROTC department. 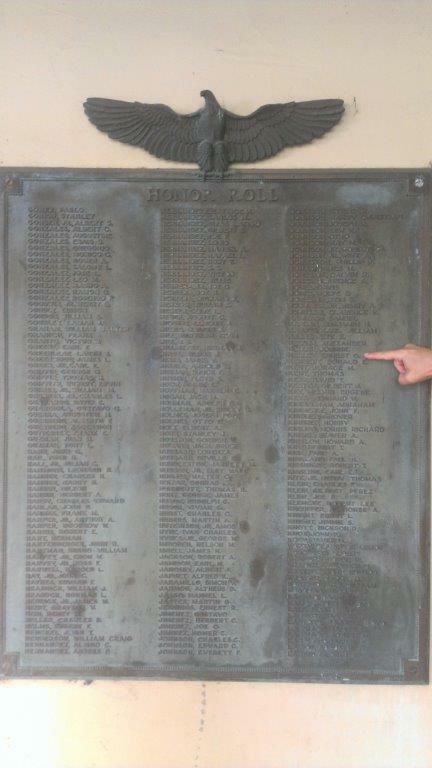 Again, within 24hr I had a picture in my hand confirming my uncle’s name on the plaque. If it seems impossible to get to all the places needed as a memoir writer, I strongly recommend a few phone calls or emails to people near the place of interest who may be able to collect the needed data. There are kind people in the world who will take a few minutes to help. Thank you Witte Museum and Brackenridge High School!